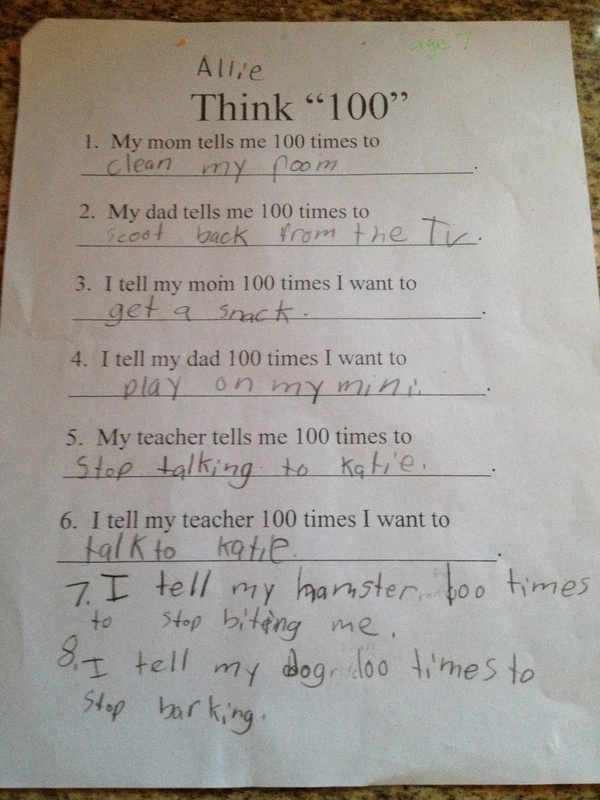 Allie brought this home from class after the 100th day of school. We got a good laugh out of it. It’s funny because it’s true. Now, I can’t imagine that I will stop harping on her room altogether. I care too much about organization and Allie’s room leaves too much to be desired. But I wish she would have had a different response to question #1. If asked what I say to her most often, I want Allie’s answer to be “I love you.” Or “Jesus loves you.” Not a command. So I guess I’ve got some thinking to do about what I need to change. What can I do differently so that my love and God’s love shines through everything I say and do? Do you need to challenge yourself with the same question?